Saddelback Ledge light is about 3 miles southeast of Vinalhaven Island, in the Isle au Haut Bay. 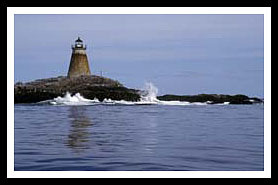 Saddleback Ledge Lighthouse is situated on a dangerous rocky ledge halfway between Vinalhaven Island and Isle Au Haut. In 1836, when the ship, Royal Tar, which was carrying a cargo of circus performers and animals, caught fire and sank near the ledge, it spawned public outcry and petitions for a lighthouse to be built on the ledge three years later. Many lighthouse keepers have described Saddleback Lighthouse as one of the most remote and barren locations of all Maine’s lighthouses, with Maine’s stormy waves constantly washing over the ledge. The first keeper was Watson Hopkins who had nine family members living inside the second floor of the tower as the keepers cramped quarters, with no separate dwelling. In 1843, his wife Abigail gave birth to a baby girl at the station and needed transfer to the mainland. On the way to the mainland, the baby was dropped briefly into the icy water, but was quickly pulled out before any serious harm came to her. Because the ledge was known to be one of the toughest locations to land a boat, in 1885, a derrick with a swinging arm and attached chair was added to help in getting keepers and visitors on and off the difficult rock island for many years. There have also been occasions where keepers have recorded strange accounts of multitudes of dead birds piled up on the tiny ledge from crashing into the lighthouse tower. 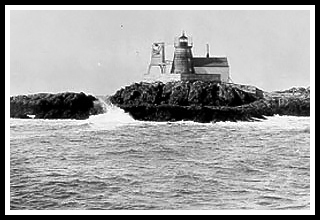 Saddleback Ledge Light was automated in 1954 and the keeper's dwelling was blown up as a Green Beret military exercise in 1960 to reduce maintenance costs. The tower still remains to guide mariners. Vinalhaven Island is a large quiet island, predominantly a fishing community that offers plenty of small beaches to relax at and clear spring fed Booth’s and Lawson’s Quarries to swim in. There are plenty of places to hike and picnic along Lane’s Island Preserve, along with various Vinalhaven town parks like Armbrust Hill, Grimes Park, Narrows Park, Isle-Au-Haut Mountain, Tip Toe Mountain, and Arey’s Neck Woods. Boat cruises and ferries mentioned below may offer many types of cruises. While some may offer specific lighthouse cruises that will pass by Saddelback Ledge Lighthouse, some will pass by the lighthouse on narrated wildlife and historic tours, while ferrying passengers, during sailing adventures, fishing tours, and other types of excursions. 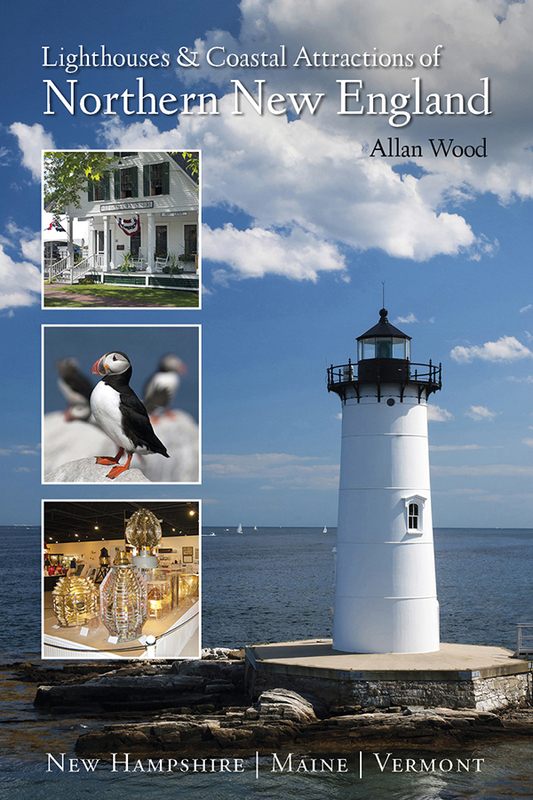 Weather is also a major factor in New England, especially on sailing excursions. Specializing in trips around Matinicus Island, including puffin trips to Matinicus Rock, leaving from Matinicus Island. Specific tours to the islands. Ferry to Matinicus Island, Vinalhaven, and Northhaven. Schooner Angelique offers lighthouse and other windjammer tours in the area. Specializing in family 3, 4, and 6-day cruises carrying up to 20 passengers. Oldest active schooner offering 3, 4, and 6-day sailing vacations along Maine’s coast.